The University College of Hospitality Management and Culinary Arts of Sant Pol de Mar (EUHT StPOL) has successfully held the Professional Development Days (JDP). During two days, more than 60 students of the Hotel-School have had the opportunity to meet with the Human Resources Managers of international hospitality and restoration chains. 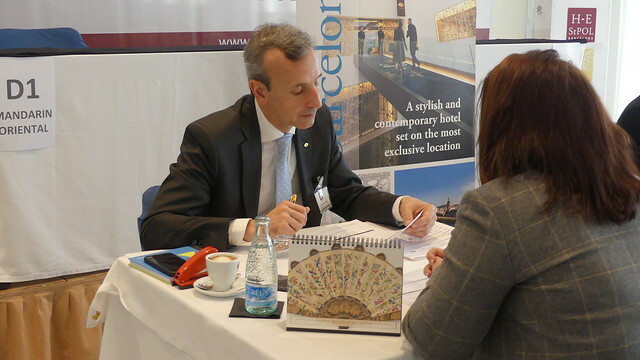 The hotel groups that have participated this year are: Barceló Hotels & Resorts, Catalonia Hotels & Resorts, H10 Hotels, Iberostar, Jumeirah, Kempinski, Mandarin Oriental Hotel Group, Marriott International, NH Hotel Group, Paradores and RIU Hotels & Resorts. The event, which is the most important of the year, is the biggest showcase for students and, at the same time, represents a source of talent for companies. The invited hotel groups come to the Hotel-School with the aim of recruiting students for a six-month internship. In most cases, these practices become an employment contract with an appropriate career plan. One more year, we can say that the Professional Development Days have succeeded for both parts: both for companies and for students. From EUHT StPOL we are grateful to receive the visit of the hospitality brands and want to wish the best to our students both in final internship and for the future opportunities at these companies.